A Life of Faith, Family, Community | HURAH! 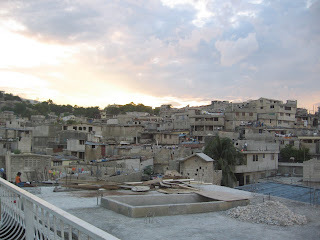 This is a pitch for changing outsiders’ images of Haiti to one of normalcy, of faith, of family and warm community. The people are beautiful, gentle, and engaging. You should think of visiting here. Those of us engaged in human rights struggles have by definition to expose unpretty scenes. And don’t forget, these scenes have their roots in the ugly practices people from the “first” world have brought here–slavery, dictatorship, terrorism. 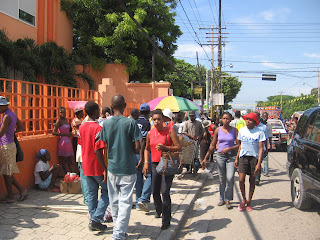 There is even a concerted effort on the part of some criminals who benefit from a bad image for Haiti. 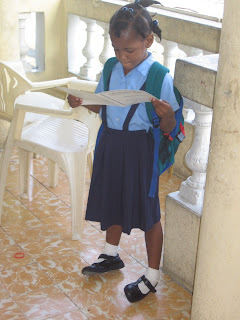 There are those also who because they have been attacked personally send out messages not to come to Haiti. 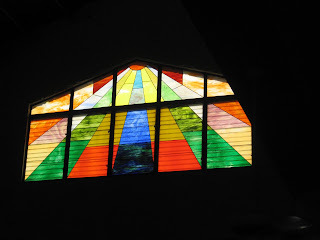 The stained glass window in Atty Fanfan’s home church is a beacon of faith and hope that inspires him and a huge congregation of 500 every Sunday at church. 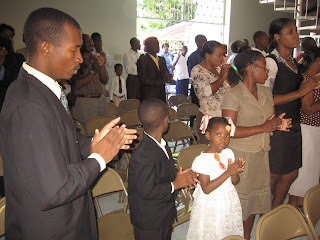 I’m suggesting that you think of Haiti as a majority of faithful, decent people. You would enjoy a stay here. You should not hesitate to come. You should support the struggling tourist industry. There are suitable vacation spots, celebrations, film festivals, concerts. It will help everyone. Or come observe and/or work with some social change group and you will enjoy it. I’m sitting here listening to a soccer game–the public electricity is on now and we have no problem keeping TV’s going. Sweden and Spain are playing and ordinary folk unlike us crusaders are crowded about TV’s everywhere. It is Saturday and people are out on the streets, crowding the lines at the banks, at the supermarkets, people just like us out getting what we need to keep home life going. Today it is the 8th birthday of Atty. Fanfan’s son, Meltary. For the last week I have been out walking in the neighborhood, out to the main street, Delmas, to the supermarket, to the bank. This is an inner city neighborhood, crowded to be sure, narrow streets, packed with small merchants. Trucks actually can navigate these tiny streets. I prefer the country myself–where we were last Saturday in the mountains and then by the sea. But city life is exciting and stimulating, no doubt about that. People party here. birthday party being celebrated. Soft music filled the background. All young parents it seemed, some with babies and children. Nice time. Walking on the streets is crowded. Especially when the street also is a place for small merchants who put their wares on the ground so that the already narrow street becomes even narrower. It is mind boggling how these folks make a living, hawking their wares. Yesterday I witnessed something that was a stark symbol of how hard life can be here. A young man, medium size was hauling one of those huge carts–they remind of a chariot or a rickshaw–you know where a human is where a horse would be in other places. As I was coming down a steep incline he was coming up and he stumbled and fell flat on his face. His load was heavy metal scrap. Another man was pushing from behind. But they both had to stop and catch their breath. Here is a picture of my neighborhood. All cement block houses. Some are decorated with filigreed railings. Life is very crowded with the houses close together. I imagine that there is a small city in just this immediate area–10,000 or more people. There is school here for those who can afford it. Universal education was a goal of the Aristide administration and more public schools were built here in his time than in the entire history of the country. The access for everyone goal is a long way off. People like the superstar rapper Wyclef Jean make a lot of collecting money for scholarships, but the system is simply not designed for everyone. But I’m back on my human rights kick. 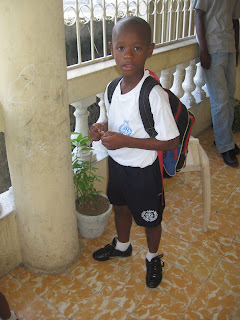 Enjoy these two school pictures of our partner’s children. O.K. here is a mundane, but environmental friendly piece of our life here. Sun is abundant here and I’ve tried valiantly to make the sun work for us. It has been slow and has had its moments of doubts. 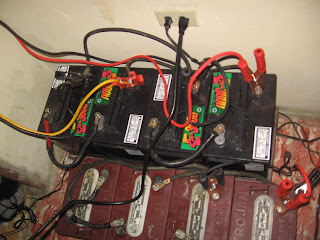 This visit I found the system: 2 – 80 watt panels, a charge controller, an inverter and a bank of 4 batteries– had been aging and that was the reason communications had been diminishing. Solar power is great but it, at least in my experience, is fickle, not just the sun hiding, but the electricity in the batteries can tend to come and go. You think you’re set for working on the computer and “wheeeeeee” the inverter screams it is low on power. So you unplug and some times even that doesn’t fix things. The inverter we purchased new is now headed for the cemetery. We went out and bought a small Vector MAXX 400 watt-800 max jobby that people sell to truckers or others with batteries to run appliances. This actually works as well as the professional one we are throwing away. Go figure. 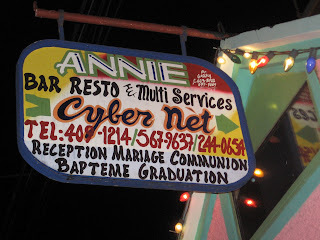 Then there is the internet hook up. At first we installed a satellite dish. It worked pretty well, but not during the rain. And then we discovered the “magic box” approach to catching the internet. This is a little portable wireless broadband receiver that you can put anywhere or carry it with you to different places. It connects to your computer or wireless router and you’re plugged in. Trouble was this first “magic box” ($100 purchase, $50 monthly fee) didn’t have a strong signal. So we had to find a new company (Hainet) recommended by a friend who does a lot of journalism uploading. It cost another $100 ($60 monthly fee), but it is fast and efficient. 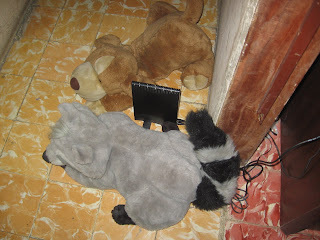 There it is being protected in our hallway by the stuffed animals! 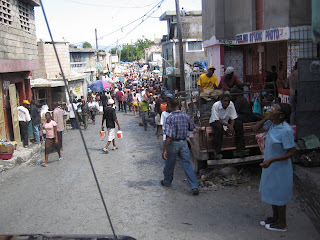 Here is Delmas, 32 block, a huge main thoroughfare connecting from the bay to the mountains outside of Port-Au-Prince. We live quite a ways up and far away from the city center. This is the local supermarket. Just like home. And people out doing their Saturday shopping–those who aren’t watching soccer. Finally there is family. 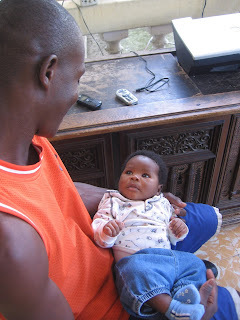 Here Uncle Saidel keeps 2 mos old Melgore happy while his parents are out. He is an extremely calm, happy baby–except when he is awake and left alone.